This recipe for Oatmeal was submitted by *Cathy* on 7/17/2005. Click here to view the recipe. I am on the go - mobile work, travel, and different schedules. Eating out is expensive, time consuming, and frustrating with the lack of nutrition at fast food and restaurants in general. 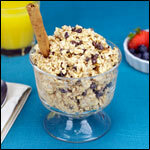 I love oatmeal and am happy to see the positive and creative recipes for healthy and filling nutrition. Thanks! I add nutmeg to mine also depending on the berries I use. I am a diabetic and love oatmeal. The cinnamon helps control blood sugar. But I do switch up my sweetener to agave - it's all natural. For those days I don't want to use artificial sweeteners. Muesli has been served cold for decades! This is such a time saver in the morning! A great alternative to hot oatmeal during the summer. I made it with steel cut oats and it was very chewy. Tonight I will try it with rolled oats. I also added 1 teaspoon ground flaxseed. Toasted coconut makes this recipe even better. Thanks! I mix in banans & cocoa powders, berries and maple syrup, some lemon yogurt, apples & cinamon, peaches, nuts, nut butters, chia seeds. You can really mix it up! Thank you for this recipe! It's great! I try to eat oatmeal most days and this is a nice way to make it seem completely different. Nice to see I'm not the only one. I've always preferred my oatmeal cold. I reminds me of rice pudding that way. My wife thinks I'm nuts. Awesome! I some how invented this on my own, because I always soaked rolled oats the night before. It's so much easier than cooking them, and you can always heat it up after if you want. I also like cold oats in the morning. I just have oats with sultanas soaked in the fridge over night, also I drink 2 cups of green tea and have lost 12 kg in 5 months. I do the exact same thing, long before I read this. We agree it's good! Mix in mashed banana and a 1/4 cup of raisins and this is delicious. I have 1/4 cup cold oatmeal every morning before I run the treadmill - I add 1/2 cup of milk and some cinnamon - Oh yeah! Cold oatmeal is great. I usually will just add milk, raisins, and a dash of vanilla-stir-and eat immediately. Great way to start the day. Ive never tried cold oatmeal before I saw this. The first time I tried it I thought it was ok but too thick for me. The second time I used more milk than oats and cinnamon,raisins and nutmeg, I also added a splash of vanilla and YUMMMMM! I wanted more! Thanks for teaching me about cold oatmeal! Also yummy if you omit the blueberries, and instead slice a banana on top and drizzle with honey. What does leaving it over night do? I love it. Try with diced honey dew melon or cantaloupe as they serve it in the Drake Hotel, Chicago and the Atlantis Hotel in the Bahamas. Yum! Always cold, with yogurt... it is great... I'll try this one... sounds delicious. I pretty much use the same idea (Oats, Milk, Brown sugar and/or Cinnamon) but I do not let it sit overnight. Our family have always eaten oatmeal uncooked and right out of the box. I was recently surprised to hear that this is very unusual... most people will eat it cooked and hot. 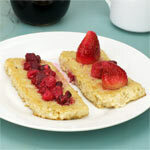 It's great with yoghurt and fruit and/or a drizzle of runny honey! I had cold oatmeal for breakfast at the Breakers last summer - so glad I now know how it is fixed - thanks. I really struggle in the morning! It seems like there's never time for breakfast! But this is AWESOME!! THANK YOU!! Bravo. I'd never knew about this and it's a great discovery. This is easy, tastes good and you can vary it up with any kind of fruit/dried fruit. It is convenient to grab on your way out the door to eat at work. That's not to mention the healthy part of it. I just mix it with water not milk and it works great! OMG!!!!!!!!!!!! Best Breakfast EVA!!! Y couldn't I think of this one... I made it once & Now I'm hooked!!! THANX CATHY!!! 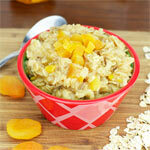 Easy healthy and what a way to get your oats.... try it you'll love it! I just found this recipe while looking for an alternative to my usual breakfast of oatmeal with blueberries and walnuts... I can't wait to try it!!! I've got it in the fridge for tomorrow morning already! I've changed this up a bit, and love it. I use 2 cups of rolled oats, 1 cup 1% milk and 1 cup vanilla soy milk. I add a little sweetener, and cinnamon, but use dried cherries, and add a little almond extract. Made on Sunday night, it works for breakfast for my husband and me for 4 days. I'm not a hot oatmeal fan, but this works! My kids and I love this recipe! I love that I can make it at night and breakfast is ready in the morning. I love this recipe. It's great in the summer and isn't as sticky as cooked oatmeal. When I make it, I use a small tupperware container with a lid so I don't waste plastic. I add the spices (cinnamon and/or nutmeg) and oats to the container, close the lid and shake to distribute. If you add the spices after the milk they form little blobs and don't mix well. Then I add the milk and some brown sugar and pop it in the fridge. I've used this recipe with steel cut oats and that works well also. I use about 1 cup of regular oats or 1/2 cup steel cut oats. I always use 1 cup of skim milk. It's also great how cheap breakfast has become. Organic bulk oatmeal is just $1/lb where I live. This is much, much cheaper than any boxed cereal. Try adding fat free vanilla soy milk for extra sweetness!!!! I've just tried this with steel cut oats and I like it anyway. You want to use less oats of course because they are more dense. About 1/2 a cup. I think it's nice because they stand up to the soaking better and add some bite and chew. I'm not a fan of mush. Thank You. The cold oatmeal is great! You mention using steel cut oats, would you still use the same amount of oats and milk, even though the calories will double? This is my favorite breakfast, ever. I'm so glad that I tried this recipe out, because it's heaven. I tend to boil the oats, though. And then I stir in salt, sweetener, fruit, nuts and dried fruits. Then, next morning, I pour fresh oat milk over it. So heavenly good. This was different and I liked it. Cold breakfast in the summer is much more appealing than a hot bowl of oatmeal. I am a stay at home mom with a young infant. All the time I can save is valued. I liked the idea of being able to wake up and just eat oatmeal from the 'fridge... however I think this taste is acquired, I didn't enjoy it as much as I thought I would. I'll stick to hot oatmeal w/butter and brown sugar. 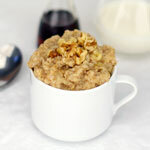 I tried this recipe with old fashioned rolled oats. It's alright. The oats were soft but definitely NOT creamy. So i microwaved until it's creamy. but soaking it overnight had saved me a lot of time though. thanks for sharing recipe. I've eaten this before my workouts, I've added yogurt and essentially turned it into muesli, I've added mashed bananas and whole berries. It is a very tasty and satisfying meal. Really makes my morning breakfast easy. I eat and enjoy cold oatmeal almost every morning. The recipe varies some, but always similar to Cathy's. I fixed it for my son one morning, but he thought it awful. Could be an aquired taste! Has anyone tried this with steel cut oats? I can't imagine that they could be eaten uncooked. Recently took a cruise and found this or something like it on the breakfast buffet. They would include various fruits but after trying it I wanted some every morning plus the recipe so I could make it at home. It appears this could be made up and serve for a couple of days; I�ll try it and see. I guarantee it is better than most might think. I just had this on my cruise. It is awesome. They added raisins, shredded pear & once apple juice (as sweetener).They would top with sliced banana, whole mandarins & a strawberry in center. Possibly chopped walnuts one day, I don't recall. I wolfed it down to fast to remember. Greetings from from Sunset, Utah. This summer, I have run two 5k races, and both times I have had this for breakfast an hour before the start of the race. It gives me the energy to run the race without weighing me down. I love the stuff! I like to make it with soy milk, and sweeten it with honey or maple syrup (the REAL stuff), and mix in a mashed banana or finely chopped apple in the morning. Delicious!